Also detected by firearm detection dogs are loaded, empty or discharged firearm magazines, shells and shell casings. They could be brass and shotgun shells. Firearm detection dogs are quick, efficient and accurate. A single dog is significantly better at firearm detection than a human search team. If you’re looking for a high profile deterrent, then consider a dog that looks impressive, resolute and active. Staff, customers, visitors, the general public and high profile individuals can relax in an environment that is being scanned by a firearm detection dog. 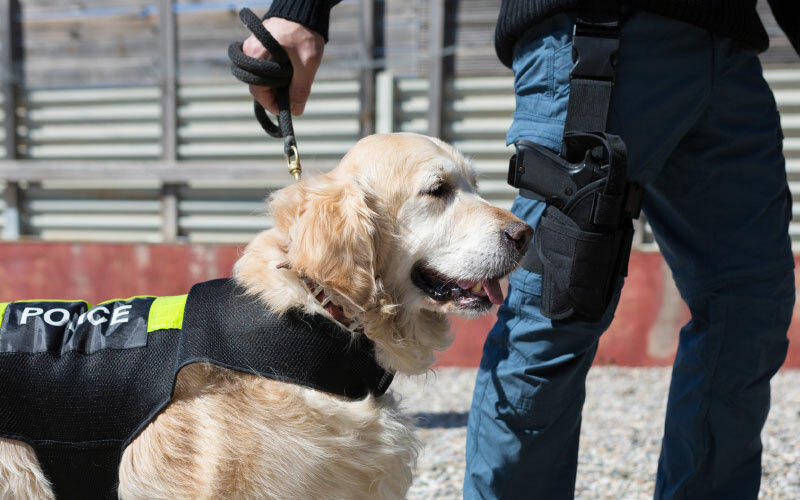 Consistency and reliability also make firearm detection dogs the cost-effective choice. When set to work to detect firearms, magazines, shells and shell casings, trained dogs do it quickly, with agility and stamina. They cover large buildings and spaces with ease. Small confined spaces are also no obstacle. They can scan and detect within commercial properties, conference facilities, event arenas or industrial units, wherever firearms dealings are suspected. Education directors might require searches of education buildings and their campus residential dwellings for a level of reassurance in certain circumstances. A detection dog presence is now commonplace at airports, shipping docks and other transport hubs. The standard of training of both handlers and dogs is at the level required by a range of European organisations and their regulators. Providing better security and operational efficiency is essential in the fight against illegal firearms dealing. SpecialistK9 are at the forefront. Find out more about firearm detection dogs and the known way to deliver reassurance to large crowds. Firearm detection dog trainers have a police or military background. Enquiries are welcomed from the UK and overseas.